Discussion in 'Classic Muppets' started by Beauregard, Dec 11, 2011.
i did not like this one. it's criminal how tiny a part piggy has, and kermit too for that matter. The problem is, there WAS no place to put Piggy as far as the story go to begin with. Jerry managed to find a way to add her in, gender swapping a character and changing the character's role. I agree her role was kinda... well... contractually obligated in the film. Not her best one, but I'm starting to dislike her role in MFS more. That's the thing about MTI over MCC... Jerry managed to warp the source material to fit as many Muppets as possible in it. MCC was more rigid, much closer to the story... and that isn't really a great thing. Seems like with MCC, the only Muppety alterations were cut and paste in front of character roles... this one was put in a blender with extra Muppet flavors and it comes out a much more fun movie overall. This part gets some serious laughs out of me! Kermit, have you learn nothing? MISS PIGGY WEIGHS THREE TONS! aw poor kermit. haha that that part was awesome i haven't seen it for years but i remember that part! Now, I really like MTI, I like how the original story was changed to fit Muppet needs, I like it better than the original in fact. Whereas, I don't like MFS and I saw that in the theater as a kid and I may have had a bunch of the Wendy's toys from MFS but, even at 4 I knew something wasn't right. And what kills me about MFS, is that Kermit and Piggy's interactions are so awkward that its almost a round-about way of trying to imply that Kermit and Piggy are broken up. I mean, I really pick up that they're broken up and I don't like that feeling. And on the subject of that broken up vibe, this is another thing that bugs me: Kermit and Piggy seem to be broken up in MFS, yet, they're awkwardly living in the same house...great example. Anyhow, back on topic, MTI is wonderful! MTI was great! Love led us here was such an awesome song that my now wife became a Muppet fan because of that very song! The movie it's self had everything and really could appeal to any and everyone. I really loved the first DVD release of the movie bonus features where so good they really put a whole lot of love into that, and then when they re released it made the movie stink just a little. MCC and MTI both have some great scenes of Kermit and Piggy... MCC having them both play that they're married, MTI giving a sense that they lost each other and didn't realize they missed each other that much... there were even some choice bits about them in VMX... but MFS lost every importunity it was given, and ten to one the lousy director is to blame. And it really seems she's been Flanderized down to "she's a diva" instead of anything even the slightest bit complex in that one. Can you explain what you mean by 'Flanderized'? I'm assuming you're referring to the Simpsons character, but I'm having trouble picking up on the context. Flanderized is a TV Tropes term. It's when one of a character's traits are utilized above all others, turning complex characters into stale stereotypes. In other words, one tiny thing about a character is ALL the character is about. Named after Ned Flanders from The Simpsons due to the writers devolving the character to ONLY be about his Christianity, rather than his original stance as the neighbor that's better in every way. 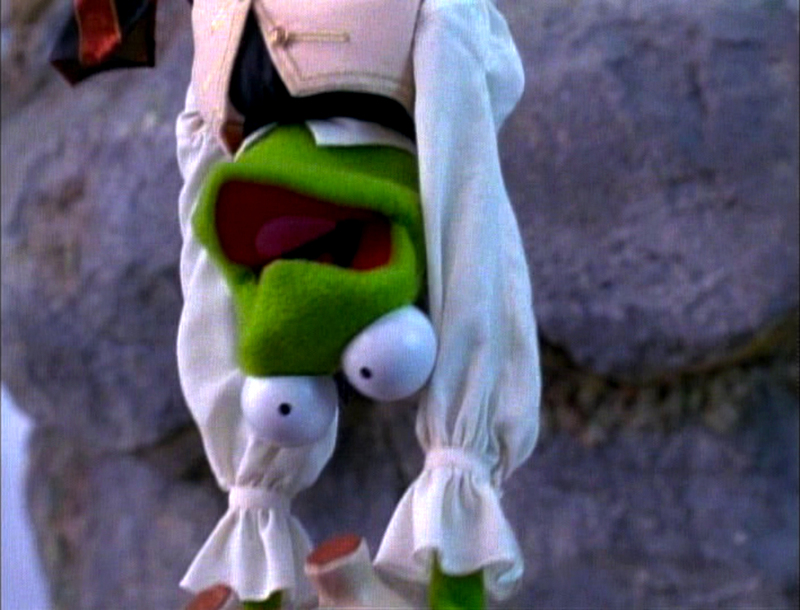 I liked Muppet Treasure Island a lot better when I first saw it. But I'm not too big on adventure. 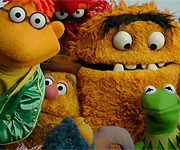 I like MTI less than Muppets from Space, but better than Kermit's Swamp Years. But it does have it's moments. Out of all the movies, it would have made most sense for this one to have it's own action figure line (it's a shame Palisades didn't get around to releasing more MTI figures), as well as it's own video game (unless you count the CD-ROM). I'm not a big fan of many of the songs (mainly Cabin Fever and Something Better). Love Led Us Here and Love Power are both very boring songs, in my opinion. But I do like pretty much all the original characters who appear in this, and there are some really funny scenes and lines (like Gonzo's limbs being stretched, the Mr. Bimbo stuff, the fourth-wall breaking moments, and other stuff). And it's funny how Sam Arrow seems to overthink things, as well as how helpful he is (going far enough to risk his life on a lifeboat implied to be unsafe). Though I wonder why he suddenly thought Long John Silver "might not be trustworthy" after seeing that his lifeboat was safe (yeah, Long John tricked him into thinking he needed to test it out, but it seems Long John tricked Sam into thinking he did it on his own). And it is a shame we didn't get more familiar Muppets as pirates. Sweetums had limited dialogue while Lew Zealand had no dialogue. Crazy Harry should have been a pirate, as should more classic monsters and frackles. And with Blind Pew resembling and sharing the performer of Uncle Deadley, why didn't they just put Uncle Deadley in that role? I wonder if The Animal Show was on the air at this point and if audiences recognized Yves St. LaRoach as one of the pirates. I have to say, this is impecable timing, for you see, I jusat finished reading "Treasure Island" for the first time today for my Children's Lit class, and will be watching "Muppets Treasure Island" for the first time in a few days to celebrate. Beaker exploding through the door scared me SO much as a child. Dr Livesy had a lot more to do in the book...and was a doctor of medicine. Dr. Livesy...is played by Dr. Bunsen Honeydew and Beaker? My favorite character of the whole novel is played by my two favorite muppets, respectively? And it is a shame we didn't get more familiar Muppets as pirates. Sweetums had limited dialogue while Lew Zealand had no dialogue. He had that one in Cabin Fever that got cut from the final movie... I don't see why. It couldn't have dragged the film down that much if it's like an extra 30 seconds of song. Hmmm, I always loved MTI as a kid, it was the one I watched over and over for some reason. I watched it last night actually and, I really HATE Jim Hawkins' singing voice. I don't get it, I just don't. It's too high and too hmmmm young I guess. Muppets are known for their amazing songs and his just aren't good. I LOVE Cabin fever and the first song. "Shiver my timbers" I think. I watched it last night actually and, I really HATE Jim Hawkins' singing voice. I don't get it, I just don't. It's too high and too hmmmm young I guess. Muppets are known for their amazing songs and his just aren't good. I LOVE Cabin fever and the first song. "Shiver my timbers" I think. Yeah, I wish they cast a less... well... effeminate kid to play Jim. If you ask me, it should have been Robin, but whatever... he's the only major problem I have with the movie. I think Tim Curry more than makes up for it, though. Big Tim Curry fan here. That is kind of me as well. It sort of reminds me of MCC where it's a pretty good kid's movie, but not as much a Muppet movie. There was an interview with Jerry Nelson where he said they had trouble finding roles for Gonzo and Rizzo... It's a wonder they didn't have Gonzo play "Robert Louis Stevenson" and Rizzo play himself. But perhaps they didn't want too much of a repeat of MCC... 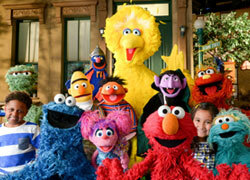 Though they did return as hosts for Muppet Classic Theater. I wonder if Scooter could have played Jim Hawkins, if Richard Hunt had been alive or if Scooter'd been recast by then. Though part of me also feels he could have played Mr. Arrow. I remember a friend mentioned this idea to me a couple years ago and when I first read it, I instantly fell in love with it. Granted, I may sound a little biased since Scooter is my favourite muppet and I know there are probably going to be some people who will disagree but I really do feel he would've been perfect for the part of Jim Hawkins. I do wonder myself if this could've happened if Richard had been alive or Scooter were permanently recast at the time. But I do think there could've been a good chance, if they were looking for a muppet character to play Jim Hawkins instead of a human. Also, considering the loyalty Scooter (usually) shows to Kermit and in the film the character Jim, in some way having to decide if his loyalties should lie with either Smollett (Kermit) or Long John Silver, I think is another reason Scooter would've been good in the role. Plus - for me personally anyway - it would've been so much fun to see the chemistry between Scooter, Gonzo and Rizzo and have them as the main three characters in the film. Several months ago on the Tough Pigs forum there was a thread about Muppet Treasure Island, and somebody thought Sam was miscast, as his character was helpful. I don't see how being helpful is out-of-character for Sam. I thought he was helpful... At what he thought was important (making others more dignified and cultural). Sam seemed in character to me. Someone also thought Kermit was miscast, stating that a captain is not supposed to show emotion other than stern. This is news to me... I thought I've seen many fictional captains show a bit of emotion (maybe because the captaisn I watch usually are part of comedy... But the Muppets are also part of comedy). I really wish that Scooter could have been in MCC as Scrooge's nephew instead of another actual human. I dunno where he'd be good in MTI.